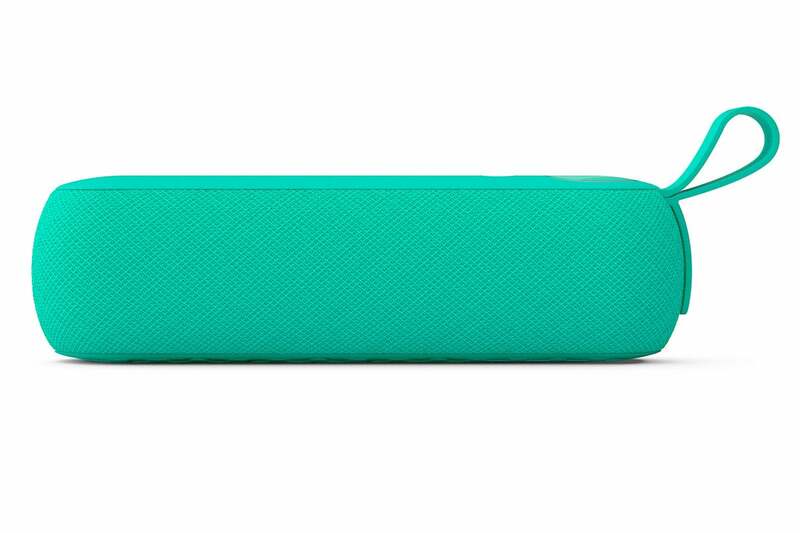 The Libratone Too’s bottle shape and loop handle make this Bluetooth speaker easy to grab and go—and it'll deliver a strong musical performance all along on the way. While the placement of its strips of rubber coating and touch-sensitive volume control indicate its designers intend the speaker to be oriented horizontally, it sounds best when vertical and at ear height. Unfortunately, the only practical way to do that is to hang it from something, because the speaker’s end is not flat. The Too’s dual 1.5-inch full-range drivers are mounted behind cloth grills on front and back of its 8.3-inch-wide enclosure. A passive radiator and an internal deflector shape sound in a 360-degree arc rather than conventional left/right stereo. If you want true stereo, you can pair the speaker with either a second Too or the slightly larger One. It doesn’t sound as weird as you think it would to have each channel outfitted with different-sized drivers, and adjusting the volume on one speaker automatically changes the other to match. That said, the single-speaker, 360-degree sound is surprisingly effective—particularly in a near-field listening situation—in large measure because the drivers are very effective at delivering the full range of frequency response. This was particularly noticeable on the Talking Heads track “Mommy Daddy You and I,” from the band’s final studio album Naked. The track opens with a laid-back Tina Weymouth bass groove that’s quickly joined by the drone of an accordion and electric guitar accents. The guitars sound lusciously full, and as David Byrne's vocals enter the picture, you never lose track of them—nor the accordion, the percussion, or any of the other instruments. You can control the volume and play/pause tracks using this touch-sensitive circle, but there is no provision for track forward/back. 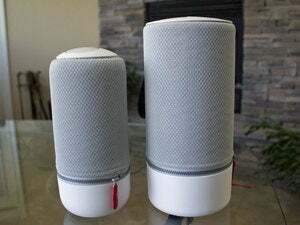 This isn’t the first Libratone speaker I’ve reviewed, but I like it just a little more than its larger stablemates, the Zipp ($299), Zipp Mini ($249), and the One Click ($199, and now marketed as just the One). The Too isn’t as quirky as those models. It doesn’t have the interchangeable cloth cover of the Zipp or the swappable handles of the One. Instead, its shape and size make it imminently grabbable and transportable. The elongated enclosure is super easy to stuff into a backpack, and the loop handle and 1.3-pound mass makes it easy to hang from just about anything with the addition of a carabiner or something similar (Libratone should think about putting one in the box). There are 1.5-inch drivers mounted behind cloth grilles in the front (shown) and back of the speaker. 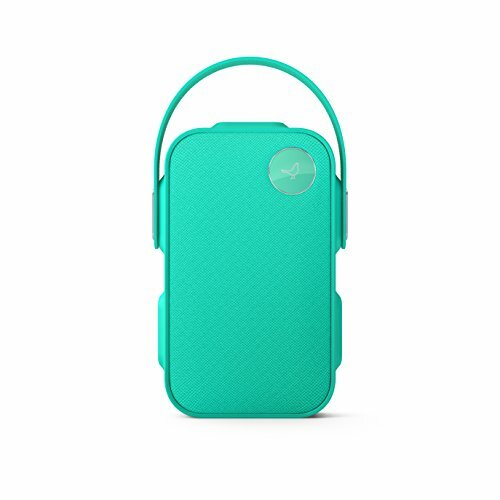 If you don't like Caribbean Green, the speaker is also available in Cerise Pink, Cloudy Grey, and Graphite Grey. 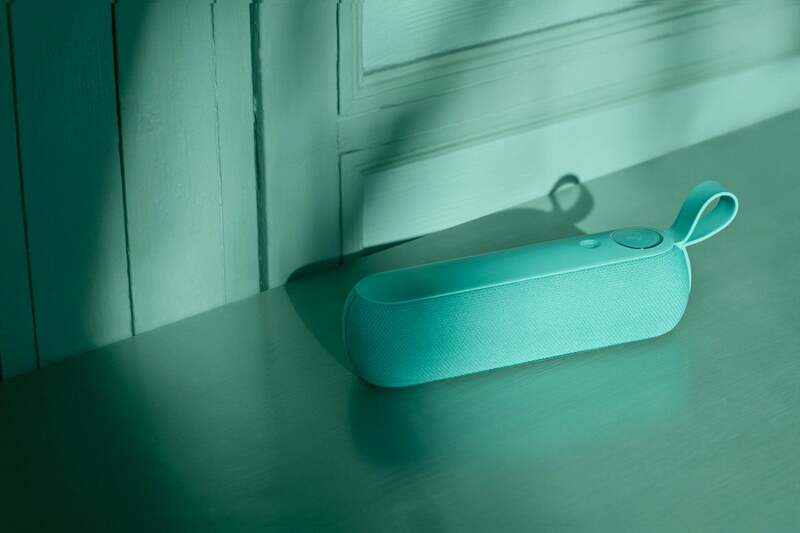 The Too is a splash-proof speaker, bearing a weatherization rating of IPX4. You can get it wet, but it probably won’t survive a dip in the pool. As with Libratone’s other speakers, you adjust the volume by sliding your finger around a touch-sensitive circle (tiny LEDs provide a visual indication of the level). Touching the center of the dial pauses the music, but there’s no provision for moving up and down your playlist. A rubber flap on the right-hand side of the speaker protects a micro-USB charging port and a 3.5mm stereo aux input, but there is no provision for charging an external device using the Too’s battery. Speaking of the battery, you can expect to get just shy of 12 hours from the Lithium-Ion. An onboard mic enables the Too to operate as a speakerphone. This is an increasingly common feature of portable Bluetooth speakers, and the Too is very good at it. 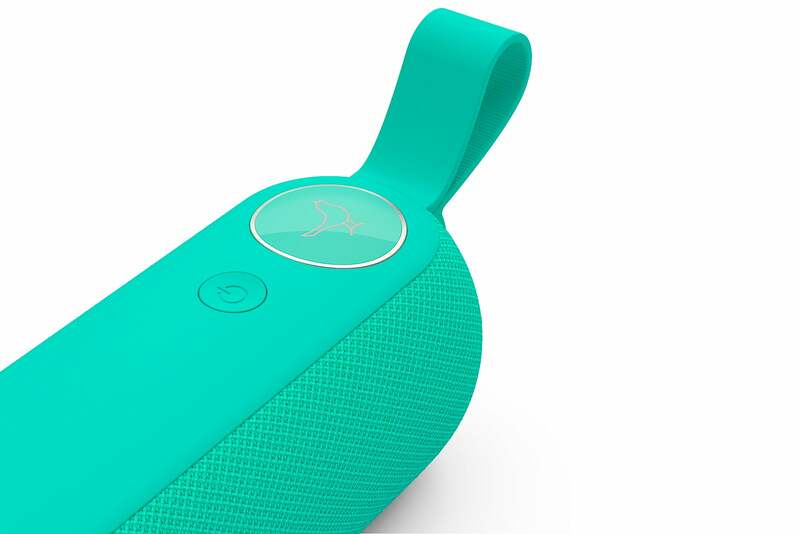 The Libratone Too is a higher-fidelity speaker than the similarly sized JBL Flip 4. But at current street prices, it’s almost twice as expensive ($149 to the Flip 4’s roughly $82 at Amazon as of this writing). Libratone does deliver some nice extras in addition to better audio quality, including a mobile app that reports the remaining battery life, streams internet radio stations (you can also launch Spotify and Tidal from within the app), and choose from nine EQ presets. That said, it doesn’t make up for the difference in prices unless you’re very, very enthusiastic about audio quality. Very high-quality sound from a small package, but its price tag brings the principle of diminishing returns to mind.